Grace channeled her cabin fever into industry today. Inspired by a spilled drum of off-brand cotton swabs, Grace started stacking them into a log-cabin-like structure, and then called for glue. 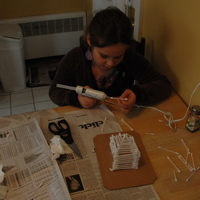 I produced a lower-heat glue gun; I also handed her, unsolicited, a piece of cardboard from a discarded Amazon book box. The impulse evolved into a project, and she worked intently and inventively for a long time, even figuring out how to construct a hip roof by herself (she didn’t know she had made a hip roof until I walked back into the kitchen, saw it, and said, “Hey, a hip roof, just like on our house!”). She stripped a twig of bittersweet, in a bunch in a pitcher on the counter, of its berries and then made a tree in her little cabin’s yard. She used the red, shriveled berries as decorations around the house. I volunteered to help fashion a picket fence after she scalded herself a couple of times with hot glue. 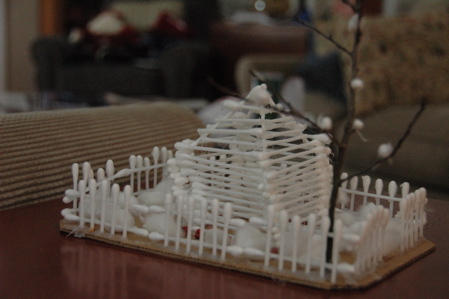 I put it on the table where the crumbling gingerbread house had been. A few of us took turns taking pictures of it. Jimmy even took a picture of Grace taking a picture. In her manner, she copied some of Eli’s photography tricks, moving both herself and her subject around, playing with angles and how she held the camera, sometimes close to her eye, sometimes an arm’s length away. 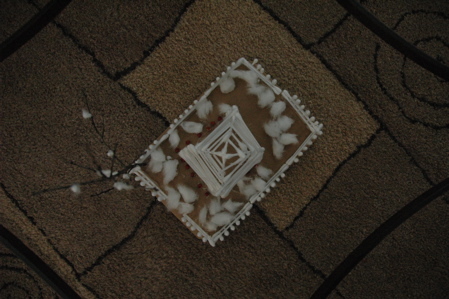 I like this one — a bird’s eye view of her house, through the glass top of the living room coffee table. And so go the days of our (winter) lives. Top picture by me; middle picture by Eli; and bottom picture, of her own creation, by Grace. so clean, fluffy, and sparse. love it.